Back in that era Patek Philippe had different qualities of escapements and adjustment that were available, based on what price point the watch wanted to be in. It can affect the price of a vintage piece, but not that greatly. I'm looking at purchasing one, and just not sure how much affect it would have on the price. Do you think a clean dal is more original and valued by collectors? Is the dial a refinish? Flicking through Huber and Banbery's Wristwatch book I didn't see any dials with a quality designation on the dial. I did come across this: "....wristwatches were produced up to the 1930's in 3 different levels of quality. The differences were to be found mainly in the construction of the escapement (e.g. the bearing of the escape wheel pinion with or without cap jewels; the use of a Breguet or flat hairspring; the quality of the balance). After this period only 'first' quality movements were produced". Personally I don't think the escapement quality would have that much effect on price for a collector unless the piece was some sort of Observatory piece. A refinished dial would have an effect, though. If the seller is asking a higher price due to the 'First quality' designation I would push back. I understand the watch to be all original, including the dial being untouched. I just have never heard/seen a Patek dealer named 'First Class". Here's a scan o t dial. like the words "First Class" have been added after the fact. From the pic it looks darker and bolder then the print above it. The dial looks in remarkable condition for being 80 years old. I agree, I've never heard of an old dealer named 'First Class but perhaps way back then there was a jewelry store that traded under the name 'First Class'. 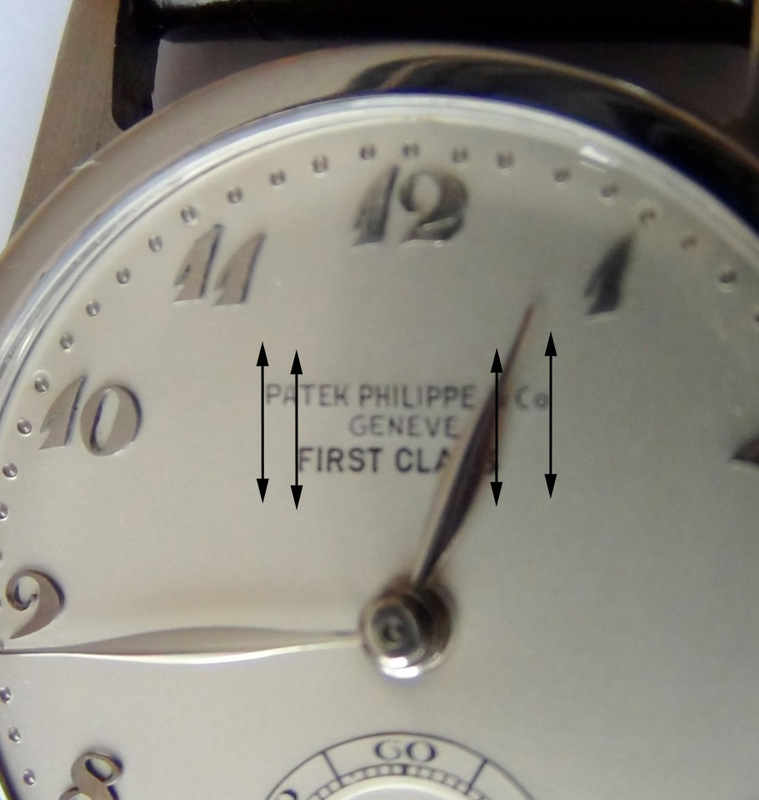 it's not even centered under the Patek insignia. Thank you for everyone's input and feedback. Its sincerely appreciated. I have decided to pass on this piece.